Henry is 4 years old and doing what - his owners say - he does best, posing for the camera! Henry also has his own email identity - ‘henry.parry03’! 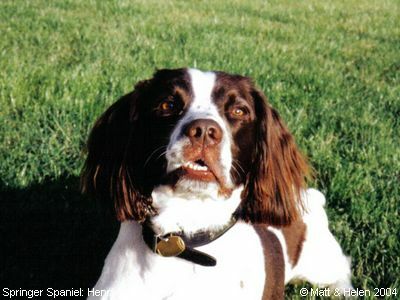 That's a cute little ‘brandy barrel’ name tag attached to his collar - my ‘Wishful Thinking’ used to have one of those! I think brown and white springers look particularly good against a lush green background such as this one!